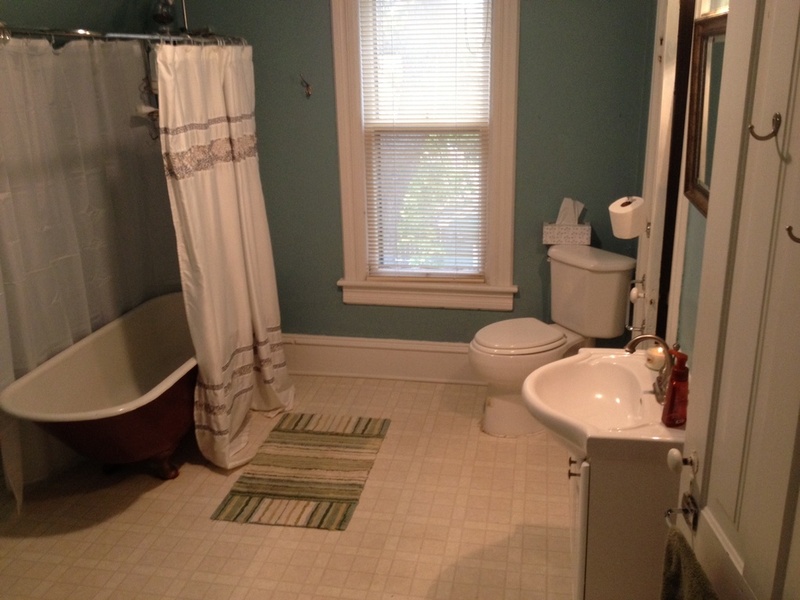 When our house was built 126 years ago, the present day bathroom never existed. It would have been a 5th bedroom, and a large one at that. The double outhouse out back would have been all they had. 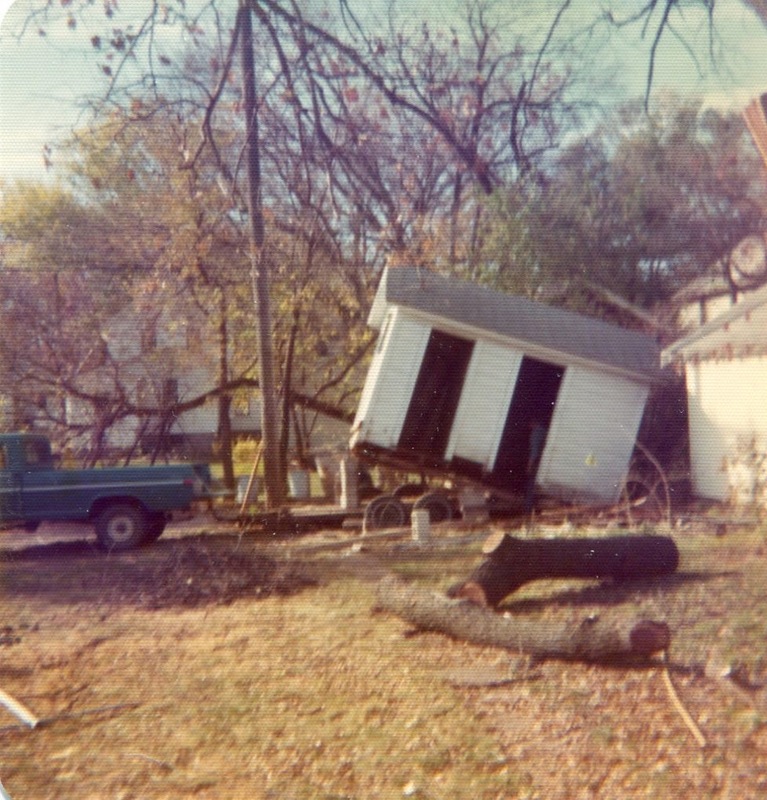 Goodbye outhouse! In this case, one is glad that walls cannot talk. 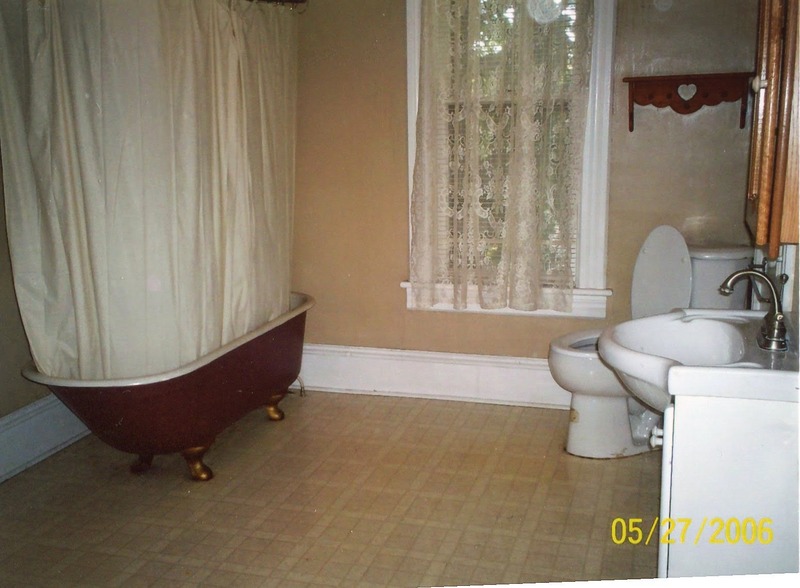 I’m not sure when an indoor bathroom was added and goodness knows I’d love to know what it looked like. The bedroom at the extreme west of our house juts out on its own; 3 of 4 sides have exterior walls. It is COLD in the winter and HOT in the summer. It is also very large; not sure exactly how big but about as big as the master bedroom. The bedrooms of our 3 kids are tiny compared to the bathroom. It also has 2 closets! 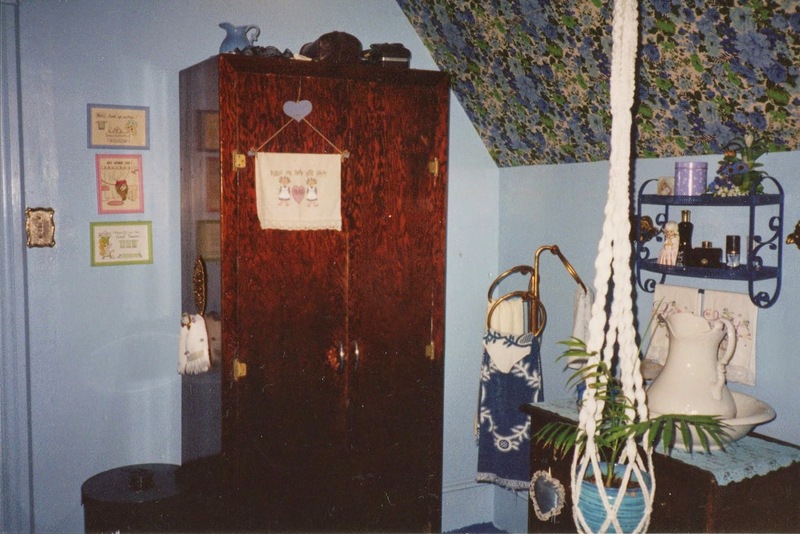 Claire’s room- the previous nursery or maid’s room, doesn’t have one at all! In many ways, it would have made sense to make her room the bathroom, and leave the large bedroom alone. We would have appreciated having a large bedroom with so much closet space. On the other hand, having such a large bathroom presented great opportunities to capitalize on the space and make use of it for our family of 5 (3 of us being female!). More about that in a later post. Within the huge library of photos that were shared with me covering over 50 years, there were several of the bathroom. 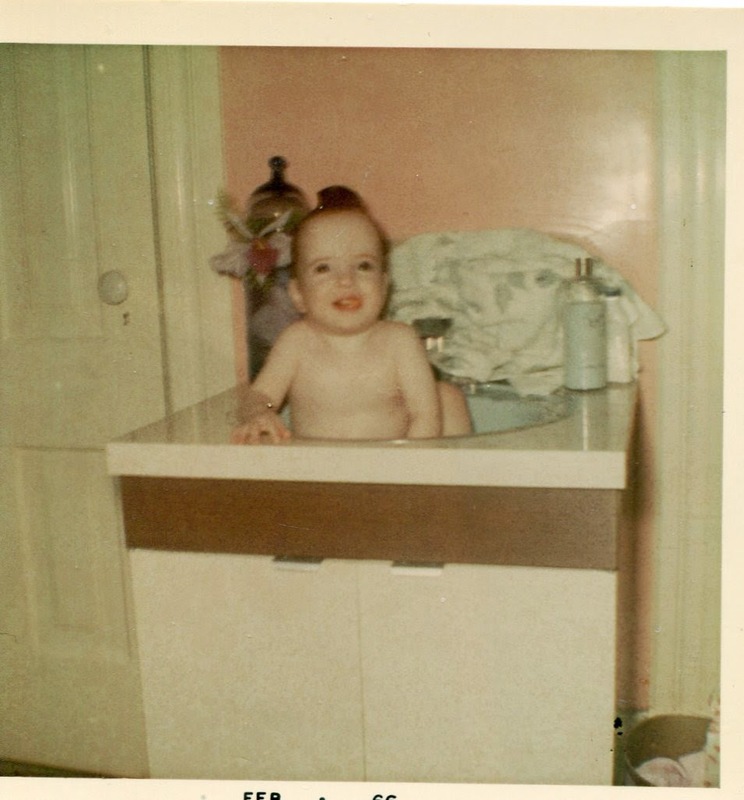 Of note: pink walls, cute baby, sink in the same place I’m sure it has always been. And several from an AMAZING 70s redo!!! 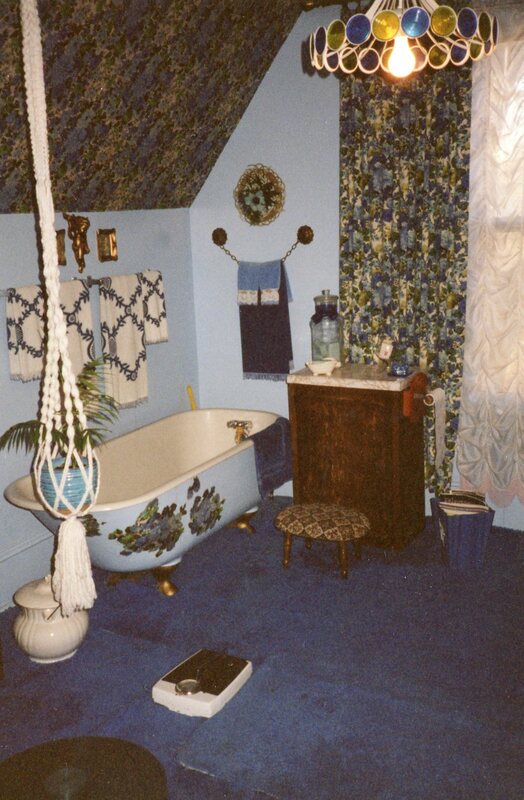 Coordinating walpaper, curtains and tub decals, blue carpet and and a macramé plant holder. This 70’s bathroom was the real deal! Check out the giant gilded mirror, artwork, and gold baby angels on the wall! I have to admit when I first saw these pictures, I was a little floored. But they actually tell me how much Mrs Ristesund loved this house and how well she cared for it. I know that she too, sat on the couch after her little ones were tucked away and planned out every detail of how she was going to make her home shine. Her attention to detail in decorating reveals that she cared deeply about her home. I am amazed by her! And also so glad the blue carpet was gone when we moved in!!! 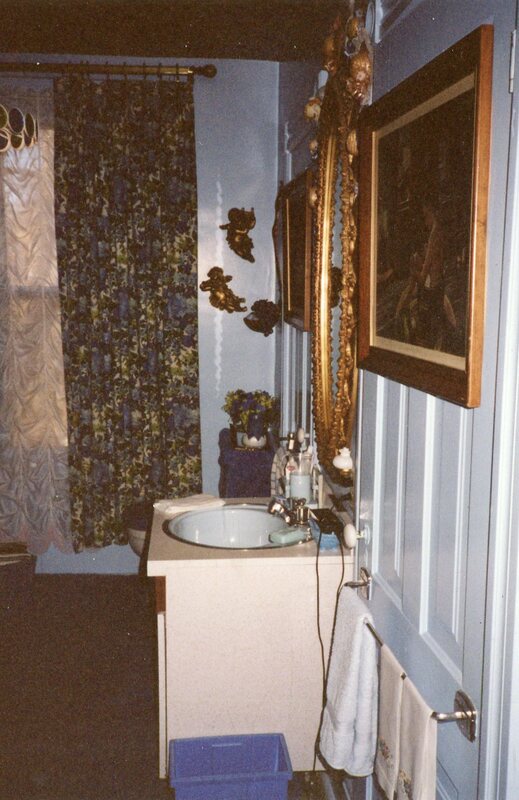 This photo from 2006 shows the bathroom pretty much how we found it; except for floor-to-ceiling turquoise walls. Perfectly servicable, but so much unused space. And one really small sink. I’m almost without words….the Seventies bathroom is…magnificent. That 70s bathroom is intense, but kind of awesome! I don’t understand why people paint doors and trim the same color as the walls, though. It pretty much always looks bad.